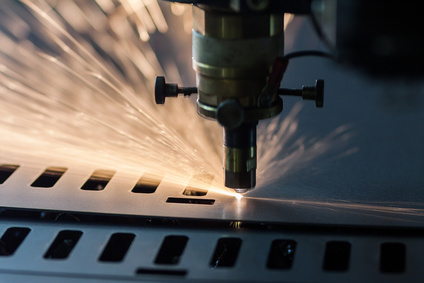 Precision laser cutting offers a world of possibilities for transforming an idea into a finished product or component that's ready for the final application whether it's in a spaceship, hospital or small workshop. The process is fast, efficient and extremely precise, and there's no need for reworking or refinishing. The first laser was developed by Ted Maiman in 1960. He used a ruby cylinder surrounded by a xenon flash bulb. Then, he added mirrors to both ends to concentrate the light that was generated by the gem. Laser is an acronym for light amplification by stimulated emission of radiation, a process where excited electrons generate light. By the mid-1960s, the technology was used in production lines to drill graded holes for making extruded wire. • Melt-and-blow methods heat metals above the melting point and blow away the molten material along the cutting line. • Flame cutting uses intense laser beams to efficiently cut through thick metal plates. • Vaporization cuts wood, carbon and some heat-set composites that don't melt. • Precisely oriented thermal cracks cut glass and other brittle materials. • Specialized laser cutting is used during semiconductor manufacturing to slice silicon wafers. Lasers are also categorized by the light amplification system and cutting process. For example, the most common light amplification sources are carbon dioxide gas and glass optical fibers that are coated with rare elements. There are dry lasers and wet micro-jet lasers that cut the material precisely, cool the heated area and wash away slag and particles simultaneously. Some lasers are suited for engraving and boring. Others are designed for precision laser cutting. When the laser cutting head is directed by a computer numerical control (CNC) router, the machine can create an unlimited number of complex shapes. The intensity of the light beam controls the depth and determines whether the material is cut or engraved. The cutting width, also called the kerf, is adjustable down to 15 microns, which dramatically increases the dimensional accuracy of the finished components. It also reduces warping and distortion by limiting the area that's subjected to intense heat. Hiring a third-party service to perform laser cutting has multiple advantages for small and large companies in terms of equipment costs, production time and personnel requirements. A dedicated partner that specializes in precision laser cutting can assist with all aspects of production from design to regulatory compliance, product testing and shipment. Project managers with advanced production experience will ensure that your project proceeds from concept to completion smoothly. A laser cutting service can help you with these production phases. During the design and consultation phase, an expert will work with you to define key objectives for the project. Design and engineering assistance is available, or you can provide existing CAD files. Cutting engineers translate complex production ideas into standardized vectors that can be rapidly computed and cut. Once the design is finalized for each product, the laser cutting equipment is cleaned and calibrated. A number of cutting methods are available depending on the material and client's requirements. Whether you're producing a prototype, limited run or full production line, the initial component is checked in-house or sent to the client for approval. Any variances are corrected at this time so that the finished product meets all design specifications. Before components are released, quality control teams ensure compliance with all requirements and regulations. Customized testing protocols developed for every client and production run ensure that all measurements and finishes are within an acceptable range. Although refinishing isn't usually required because lasers use a noncontact cutting system, additional surface and edge treatments are available. Finishing services include electrolytic polishing, heat shaping and thermal treatments. Every step of the process is customized to deliver optimal results for each production line and the client.